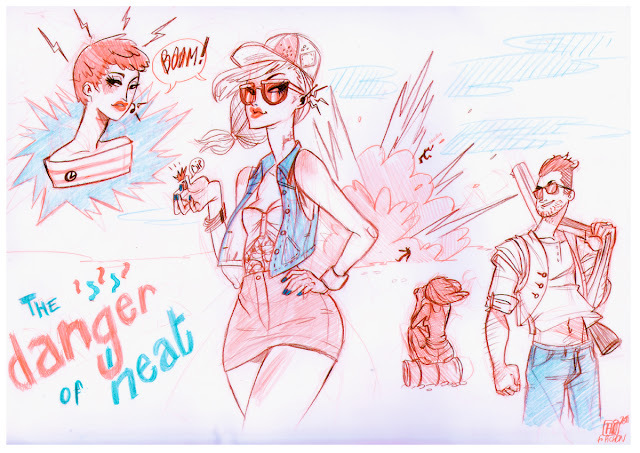 FLOWP: The Works of Florian Pichon: Heat it Up! Initially started as a floating head , and a model like girl , and turned into explosion , mercenaries and movie ad composition . FUN! Thanx to my teammate William for giving me the idea of turning the flying head girl into some Hi-tech spy device ! magnifique! I love your work! Et bien si! tu verras que j'ai rectifier le tir , parce que je le vaux bien ! Thanks a lot Celine , your work is amazing I'm glad to get such nice feedback from you !